Rebar standards specifications, characteristic according to different countries national standard. Ribbed and indented steel products covered by this document are characterized by their surface geometry, by means of which bond with the concrete is achieved. Bond property requirements of ribbed and indented reinforcing steels shall be based on surface geometry. Alternatively, bond property requirements of ribbed and indented reinforcing steels may be determined by appropriate bond tests, see Annexes C and D. The assessment criteria of these tests shall be as given in e.g. the appropriate product specification or design standard. In this case, provisions shall also be given for establishing factory production control requirements for the surface geometry based on the bond test results. Ribbed steels are characterized by the dimensions, number and configuration of transverse and longitudinal ribs. The products shall have two or more rows of transverse ribs uniformly distributed around the perimeter. Within each row, the ribs shall be uniformly spaced. Longitudinal ribs may be present or not. An example of a ribbed steel is given in Figure below. 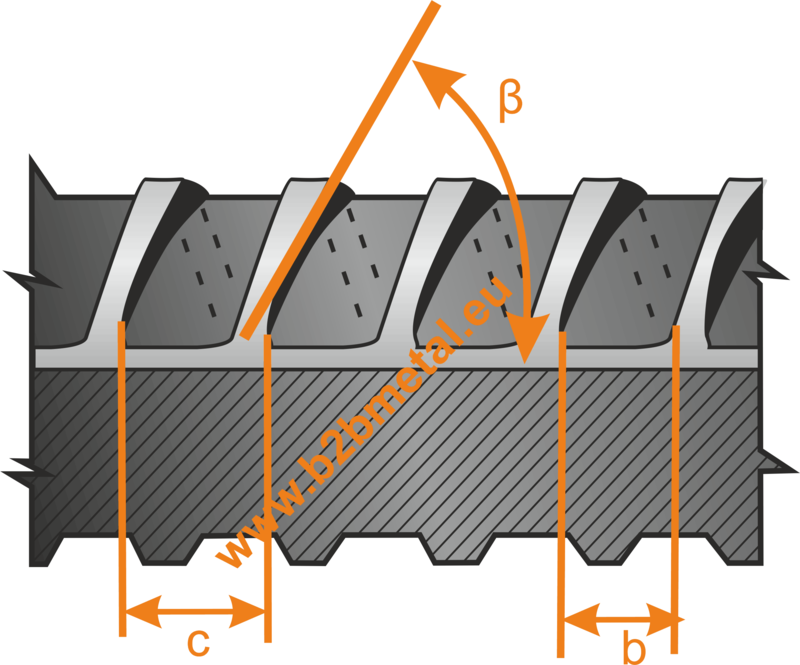 The rib parameters may be specified by either the relative rib area f R , or by a combination of rib spacing, rib height and rib inclination of the transverse ribs, or by both criteria. 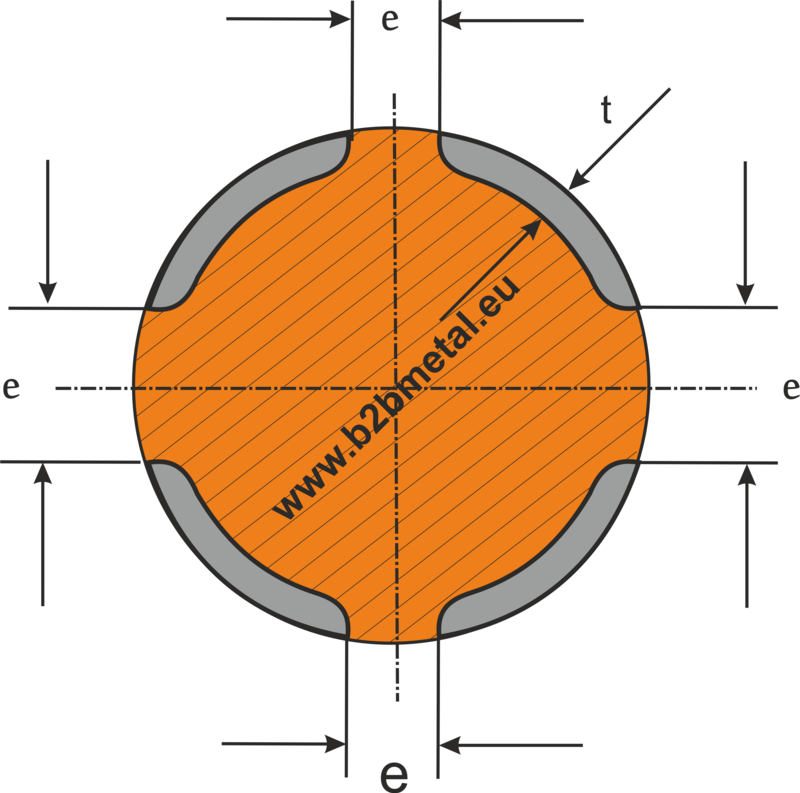 Measurements of rib parameters and fR shall be performed according to EN ISO 15630-1. The values of the indentation parameters shall be within the ranges given in Table below, where d is the nominal diameter of the bar, rod or wire. The indentations shall form an angle of inclination with the longitudinal axis, ß of 35° to 75°. Sum of gaps Σe max.